Simply open the outer package and expose the packet to air. No shaking is necessary. Remove the protective backing and adhere the Adhesive Body Warmer to inside of clothing over area of body that needs relief. Do not apply adhesive side directly to skin. 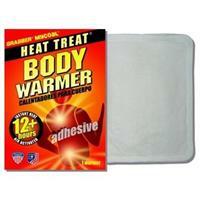 The Adhesive Body Warmer is designed to warm gradually and reach average temperature in approximately 20 minutes. Avg. temp. 127F (53C), max. temp. 154F (68C) when used as directed. Each package contains 1 Warmer. Keep your core warm on those brutal days on the slopes. Provides extra warmth when needed. Can also be used for other activities or watching your favorite fall sport.